We don't always realize how important this day is and how much we have because of the millions of men and woman that have and still are fighting to keep us safe and protect our freedom. So many have lost their lives giving us things that we (often times) take for granted; but you can bet their families don't ever forget....they all sacrifice so much. Even in a military job that doesn't really have a meaning, you are at the mercy of those in authority over you and if they tell you to jump you jump and all you can do is pray that you make it. 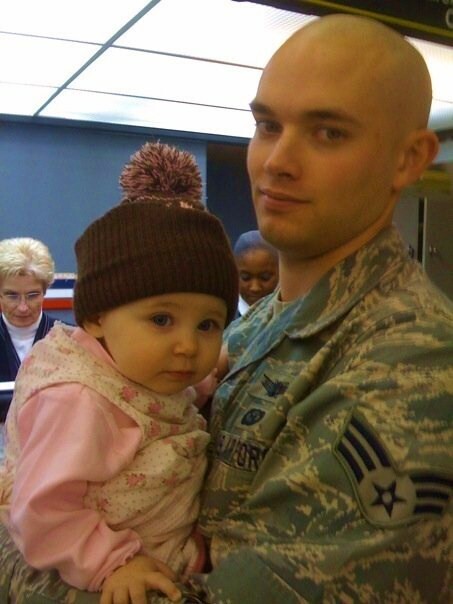 Jacob had to leave for his 6 month deployment last year when Abigail was 9 months old and I was almost 6 months pregnant. I can't even describe how difficult that was for all of us, but we made it through and Jacob came back to meet Bethany! 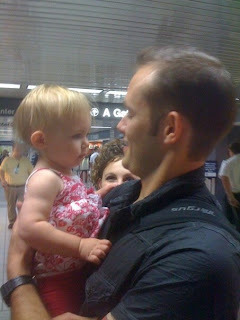 She doesn't seem to notice that anything out of the ordinary is going on, but this was in the airport the day Jacob got back! 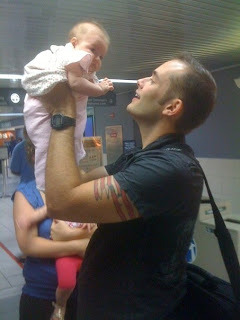 Abigail getting reacquainted with her daddy in the airport! I'm so glad that we don't have to worry about anymore deployments, but we still need to remember all of those that are deploying or still deployed and their families....so a big thank you to all that have served and are still serving in any area of the U.S. Military! I love you so much Jacob!